One of the world's leading suppliers of plastic lighting enclosures. Made in the USA, our products are top quality acrylic, polycarbonate and polyethylene plastic spheres, streetlamps, cubes, cylinders, and special shapes and accessories designed with and for Original Equipment Manufacturers (OEMs) and aftermarket distribution. Manufactured in Festus, Missouri, USA, our employees focus on the quality of our products. They take pride knowing that their workmanship will be seen by people around the world. Our customers count on quality, and we deliver. Our design team works directly with customers to gain insight into their needs. Only then do we begin to develop world class products in our professional design studio. 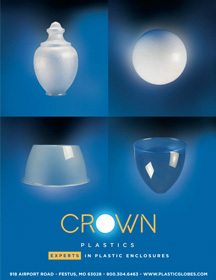 A founding principle of Crown Plastics is the necessity to provide impeccable customer service. Our business is focused around our customer's needs. Crown Plastics is pleased to introduce our new Capabilities Brochure. Click on the image to the right for more information on Crown Plastics core business, capabilities, and new products.